“5-Minute Book Marketing for Authors” is one of sixteen books Penny Sansevieri has written to help authors develop tried and true marketing strategies. Ms. Sansevieri explains exactly what to do in very easy-to-read detail. I can’t imagine that any author following these guidelines would fail in their efforts. From the first page until the very last sentence, she provides advice on any topic one could think of, from optimizing Amazon to designing an eye-catching Goodreads profile, to creating eBook promotions. For new authors I imagine this amazing book to be worth its weight in gold. Each chapter is listed by topic and gives authors the opportunity to choose any topic they are interested in at the given time. Sansevieri has the incredible talent of presenting information as if she was talking personally to you, explaining things with easy-to-understand language, and sharing what she found works best for her. As I was reading this book, I was excitedly telling my author husband what I learned. Normally I make notes in the margins or highlight passages I want to focus on in greater detail; however, I would have highlighted the whole book. Each chapter ends with 5-minute calls to action which provides quick focal points without having to thumb through the whole chapter. Another great point is marketing one’s book on Facebook. It doesn’t surprise me the average person spends 50-minutes a day on Facebook. There are also several links to videos provided that shows actual material the author has written and put into action. The information on blogging, building a website, and newsletters is another area where authors can build a fan base. One area that I am a big fan of is doing talks at book clubs, being a vendor at craft festivals and getting to be friends with local book sellers to set up book signings. At 140 pages, there is so much information provided authors can’t go wrong. 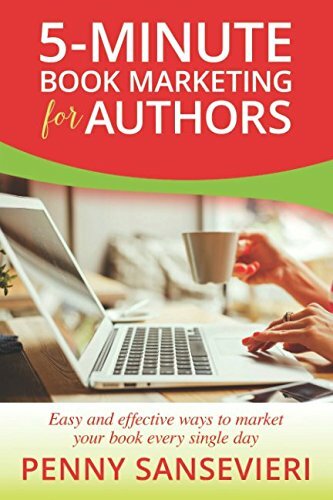 I highly recommend “5-Minute Book Marketing for Authors” by Penny Sansevieri to all published authors, and those beginning their writing journey.